SCORES of youngsters joined the Affirmative Repositioning group this morning to hand over a memorandum to the City of Windhoek CEO in which they are demanding for the occupation of empty mass houses amongst others. 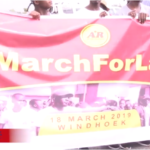 The group, spearheaded by Job Amupanda marched from the Katutura Magistrates court before proceeding to parliament where they met Peter Katjavivi, Speaker of the National Assembly. There, a bill on the Regulation of land ownership by foreign nationals was submitted. The land movement further demands that the continuous demolition of shacks be abolished. Aveshe Mbadhi who read the petition said that over 300 mass houses constructed at Otjomuise remain unoccupied when there is over 300 000 people living in informal settlements. “It is an indication that government has no sense of urgency in dealing with the housing crisis. We therefore demand that the houses be allocated and occupied within six months. Failure to do so will force us to allocate these houses ourselves,” Mbadhi said. The group also demanded that servicing of the 300 plots at Goreangab which started five years ago be finalized. The immediate discontinuation of colonial urban settlement policy and practices and low cost and social houses in suburbs like Kleine Kuppe, Ludgwisdorf, Avis, Eros and Klein Windhoek was also addressed to CoW CEO. The proposed bill suggests that no land in Namibia shall be owned by a foreign national and that they may only utilize land in Namibia on condition that they lease it for economic development, provided that they enter into partnership with a Namibian who may not own less than 51% of the shares. They further propose that foreign nationals do not lease any agricultural or communal land.